Yes I’ve an other release for you ready. The design team and me, are so exciting to show you a new Newton’s Nook Release… So here we go. *Ja, ik heb een andere release voor je klaar staan. Het designteam en ik zijn zo enthousiast om jullie de nieuwe Newton's Nook Release te laten zien. Dus hier gaan we. For this release day I stepped out of my comfort zone and tried making two CAS (= Clean And Simple) cards. Let me know if I succeed hihi. * Voor deze release dag stapte ik uit mijn comfort zone en probeerde ik eens om twee CAS (= Clean and Simple) kaarten te maken. Laat me weten of het lukte hihi. First I stamped all the leaves on a background. I used watercolor paper and stamped them with Dark green Momento ink and after that with the lighter green ink. This card didn’t need more that a banner with a sentiment. The sewing really helps to make it complete. * Eerst heb ik alle bladeren op een achtergrond gestempeld. Ik gebruikte waterverfpapier en stempelde ze met Momento inkt en daarna met de donkerder groen. Deze kaart had niet veel meer nodig dat een banner met een leuke boodschap. On the other card I just used the leave stencil directly on the card base. Than I stamped out the two leaves with black ink on Copic Marker paper. This paper really helps to show how pretty detailed these leaves are. I cannot describe it, but this “print out/jeans” look on these leafs are amazing. * Op de andere kaart heb ik het blaadjes sjabloon direct op de kaartbasis gebruikt. Daarna stempelde ik de twee bladeren met zwarte inkt op Copic Marker papier. Dit papier helpt echt om in detail te stemmelen, je ziet nu echt hoe mooi ze zijn. Ik kan het niet beschrijven, maar deze "print out / jeans" look op deze bladeren is geweldig. Would you like to win the “Shades of Autumn” Stamp Set? This set will be given away to ONE lucky winner! Here's how to win: Comment on the NND blog and Design Team blogs (see list below)! The winner will be chosen at random from the collective reveal posts. Make sure to check out each of their blogs and comment for your chance to win. You will not know which blog has been chosen so the more you comment on the better your chances are of winning! You have until Thursday September 14th at 9pm CST to comment -- winners will be announced on the blog post on Friday, September 15th. * Wilt je graag de “Shades of Autumn” stempel set winnen ?Dee set word wegegeven aan ÉÉN gelukkige winnaar! 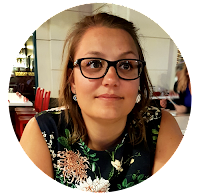 Hier is hoe je kan winnen: Schrijf berichtjes op de NND blog en de Design Team blogs (zie onderstaande lijst)! De winnaar wordt willekeurig gekozen uit het collectief van berichten. Zorg ervoor om op elke blog een commentaar te schrijven voor je kans om te winnen. Je zult niet weten welke blog gekozen is om de winnaar uit te zoeken; dus hoe meer je schrijft hoe beter je kansen! Je hebt tot en met donderdag 14 september om 9 uur CST om berichtjes te schrijven - de winnaars worden bekend gemaakt op de Newton's Nook blog post op vrijdag 15 september. Both of your cards are gorgeous. Love your techniques. Wonderful cards. The Falling Leaves stencil is a must have. Theses are amazing! I love fall and fall inspired cards! those cards are so prety! Love the one with the green leaves!! Cool idea with the sewing! Great cards! The sewing adds a perfect touch. Thank you for sharing your cards. They look wonderful. The green and brown are wonderful together. Both your cards are lovely! Beautiful cards! Love the leaves and the colors you used! SO cool Ellen, love them both! Loving your cards with the stenciled background and that pop of green in the front. It's just gorgeous. Thank you for sharing! Wow! Amazing Fall cards!!! Love them!!! Love the fall leaves! Great card. 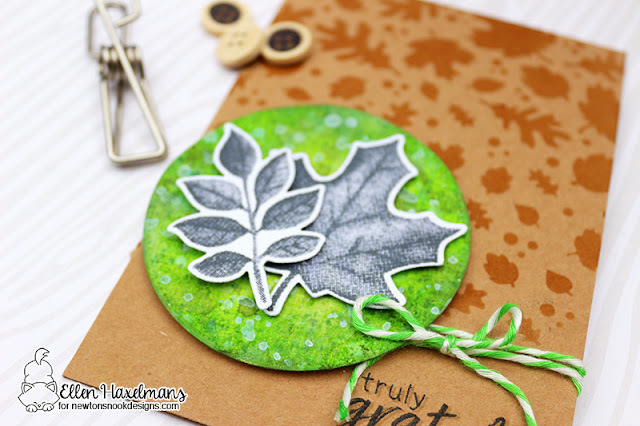 Great fall cards!, these leaves are so pretty. CUTE cards! You do such pretty work....good job with the new leaf stamps! Lovely cards, love the coloring of the leaves! Your cards feel more out there in nature besides just incorporating fall. It is so lovely. Oh my gosh!! Love the way these cards look!! I think you hit CAS on the nose :) That green & blue background ~ yes!! Plus the black inked leaves - never occurred to me & it looks sensational!! Wonderful cards...love the great images in this set.